In our latest episode, Tiny Spark takes a look at the quality of care those volunteers provided. While they may have been well-intentioned, medical volunteers’ lack of specialized training would sometimes have severe repercussions for patients. 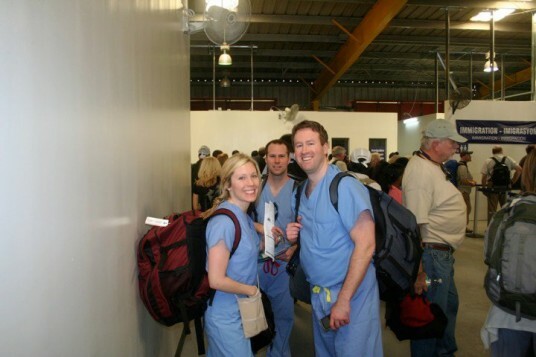 We also speak to Andy and Jennifer Day, a couple from Indiana who decided to volunteer their medical skills in Haiti. The Days had never worked outside a US hospital before, which makes them pretty typical among the medical volunteers who went to Haiti. Jennifer, a registered nurse, says she was left to her own devices working at an orthopedic clinic in Port-au-Prince. “Really there was no one to tell you what you should be doing or how this clinic was supposed to be run.” She got there six weeks after the earthquake and says there was no system of record keeping for patients. Jennifer’s experience highlights one of the central challenges of international emergency medicine. There is no central coordinating body to oversee the many medical volunteers who go to crises like Haiti’s. Teams and individuals are not required to sign up with a central authority or to be approved by one. See more photos from a surgeon in Haiti. Hello, I enjoyed your podcast a great deal and as a nursing student who is planning on working with the military in the future it gave me a greater insight as to the challenges working in a disaster zone. That being said, a major question that I have is with the references used, I did quick google searches but was unable to come up with much information, often times it was a quick circle back to your podcast. Would it be possible to provide links so that interested readers could quickly look at the sources for themselves to assist in gaining a deeper understanding of the issues. I think Jonathan Katz’s book, “The Big Truck that Went By” is a great resource on Haiti post earth quake. I went to Haiti days preceding the coup of Aristide. It is the most maddening place in the world. The best visual that I have seen on this is from Anthony Bourdain where he is eating at a roadside stand. He sees hungry kids and a cook who is trying to make a living. He says to himself, “I will feed the kids and give the cook money. Win-win.” Within minutes a riot breaks out. That is Haiti. As I was on my work trip, I realized two or three days in this uncomfortable reality. I was eating three meals a day, but the Haitians who worked with us ate one meal a day. What do I do with that? If I reduce the food intake then the guest house has extra food. What do we do with the extra food…give it to somebody and create a riot, give it to an agency where it is sold out the back door, give it to a worker in the guest house what happens on the walk home? Only the tribal regions of Pakistan might be more illogical, but Haiti is safer. Thanks for sharing your experiences, Guido. Yes, ethical dilemmas abound in these kinds of situations. Every well-intentioned decision seems to run the risk of myriad unintended consequences. But this is why we must demand transparency about what worked in, say, post-quake Haiti and what didn’t work. Keeping so-called “failures” to ourselves makes it impossible for any of us to move forward more effectively and responsibly. How can we possibly learn if we are not transparent? From reading this exchange, it seems pretty clear that the answer to the question in the headline (“Haiti’s Medical Volunteers – Helping or Harming?) was decided long before “Tiny Spark” stepped off the plane in Port-au-Prince. There was a hypothesis, which the correspondent sought to prove. Any countervailing evidence – and it seems clear that there is – seems deliberately ignored, to prove a point. Who would report on a matter of public health in Haiti without seeking input from PIH? Google “Haiti Health” or “Haiti Medical” and PIH is one of the top 5 results. Not everyone worships at the alter of Dr. Paul Farmer, but omitting them seems to defy logic. “What I wanted to look at in particular are the challenges facing international emergency medicine.” That’s reasonable – and there’s nobody better suited than PIH to answer that very question. Certainly better than to lead off by talking with people who cite Justin Timberlake and George Clooney as their inspiration for leaving the suburbs. This blog is supposed to be about the business of doing good, but the stories read more like the search for why everyone always gets it wrong – and avoiding anything that might contradict that hypothesis. The question posed in the headline is answered in the story: Help was delivered AND harm was caused. My story is filled with the voices of seasoned experts in international emergency medicine who articulate what’s expected of you if you wish to volunteer in international emergency medicine. And there is strong evidence that harm was caused by countless well-intentioned but under-trained and ill-prepared volunteers. It’s impossible to know the scope of the damage caused to patients because, as I say in the story, there was a lamentable lack of reliable data generated by volunteer medical workers and many aid organizations that worked in Haiti post-quake. If you’re interested in a story about the work of PIH around the world and how they deliver healthcare in resource-poor settings, that’s an important but entirely different story than the one I’m reporting here. Finally, I’d like to address your contention that my stories only point to people who “get it wrong”. In fact, every single one of my stories includes lessons learned, they highlight who is carrying out activities more responsibly, and why. In fact, being constructive is an integral part of the reporting I do with Tiny Spark and the record proves it. Thank you for listening to my program and for taking time to write. Oh, and I never “stepped off the plane in Port-au-Prince”. In fact, I’ve never been! Amy — Heard you on NPR. Gave you a shout out on my blog PhilanthroMeme which looks at charitable ideas moving, evolving, adapting between cultures. Thanks so much, Heather! I appreciate the shout out. It looks like you’re involved in some important and innovative work at philanthromeme. Wishing you every success! Thank you for doing this piece. I worked for several months as a medical volunteer in Haiti after the earthquake, and your work hits on a lot of the issues that I’ve been thinking about. It shows the conflict between good intentions and what is effective and appropriate on the ground. Beyond that, for me it is about respecting the fact that we are foreigners in another nation’s home, and that our eagerness to help must be tempered with a willingness to adapt to a new environment with potentially different opinions, priorities, and expectations. When I was working in Haiti, I found that in order to provide a high level of care, we had to understand the political, social, and economic conditions of our patients. The medical experience of the doctors that I worked with was essential to fill the gap created by losing a generation of Haitian medical professionals in the earthquake. However, those expertise were not enough to decide, for example, how to understand the condition of a girl raped in the tent camp or a young man brought to the hospital by the same police who had beaten him. We were working in a racially, politically, and culturally charged environment, and our medicine had to adapt to the circumstances. Achieving this understanding meant putting aside our sense of American superiority and trying as hard as possible to work with our Haitian colleagues. For me it meant finding the humility to say that my education was inadequate and filling the holes wherever possible. It meant learning Creole. Most of all, it meant seeing our little hospital as a stopgap measure, patching up the wounds of a city torn by much deeper problems. I don’t think American volunteers are the answer. While volunteerism is laudable on the individual level, we will have to come together to advocate for more lasting political and economic changes. The earthquake flattened Port-au-Prince, but it was a century of international neglect, economic exploitation, and governmental despotism that created an overpopulated city with no building codes, high unemployment, and staggering poverty. As Steve does point out, there are exceptions such as PIH that have found a working model that combines anthropology with medicine to provide situationally sensitive care that is much more inclusive than the traditional volunteer model. However, in my time in Port-au-Prince, I found this model to be in the minority. More visible, for me, was the menagerie of volunteer organizations that did save lives but suffered from poor coordination and a poor understanding of the Haitian environment. I will continue to follow your blog. Thanks for your work. Thank you so much for sharing your first-hand experience in Haiti. What a utterly complex working environment you’ve described here. You touch on the issue of “humility”. That’s a word that cropped up several times in my conversations with seasoned medical professionals who regularly work in international crisis zones and/or developing nations. They frequently expressed to me how difficult it can be for novice volunteers to find their own sense of humility when deploying to a nation where they don’t know the language, politics or customs. It seems you were part of a team that was aware of all the non-medical issues that impacted the quality of care you could provide. Bravo to you for having the humility to recognize this and then adapting your medicine accordingly. As with any cross-cultural interaction and as with almost any volunteer opportunity, it is often the “giver” who realizes how much they have to learn, how much they lack. And it is often the so-called “recipient” who has much to teach. Thank you for your sensitivity in your approach to this topic. I have an even deeper appreciation for the complexity of working in Haiti after having read your account. Thanks for listening and for taking part in this conversation. A perfect article. It covers all the problems all the volunteers do bring to an operation, like Haiti. At the end it´s more a lifetime experience for themselves. Thank you, Gerhard. Many argue that volunteering – or any act of altruism – is filled with mixed motives. Interestingly, one surgeon I interviewed also questioned the value of programs that send medical students to developing nations to “help” local populations. The doctor I spoke to contends that these trips benefit the med students primarily, have dubious impact on patients, and that the students’ inexperience in fact taxes already over-worked local doctors. The surgeon contends that what these local doctors really need are seasoned international specialists to assist them, not med students. I don’t have an opinion on this because I have not researched it but it certainly gave me pause. Thank you for taking the time to consider my reply and to write a thoughtful one of your own. I appreciate the work you’re doing with Tiny Spark to try to highlight the challenges in humanitarian work, and I recognize that you want the stories here to be constructive, not simply critical. That’s why I was surprised that you didn’t even mention PIH – indeed, they are a twenty-five-year-old model of coordination and training. Dr. Farmer’s name was put forward to be head of the World Health Organization; ultimately, his PIH colleague Dr. James Kim was nominated to that post. I simply felt that you could have recognized their work in your story as not just a “suggestion” for how things could improve (more training, regulation, accreditation) – they are a living example of how things are being done better. Again, thank you for your work and for listening to so many voices. Nice work Amy. The interactive images that link up to the audio are brilliant. Thanks, Tom. I did the interactives with Thinglink.com. Super easy and I like the way it frees you up from the confines of the traditional audio slideshow to enable viewers to pick and choose what they hear and see. I heard the abridged version of this piece on PRI’s “The World” on October 11, and I was dismayed at the lack of any mention of Partners In Health. With her obvious interest in human rights and global health, and her years of living and working in sub-Saharan Africa, I’m sure Amy Costello is familiar with the work done around the world by Partners in Health. 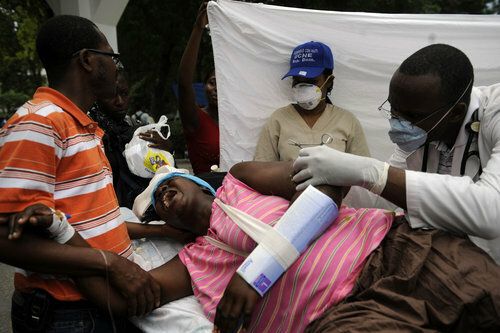 PIH’s work in Haiti was instrumental in the emergency medical response to the 2010 earthquake. They were one of the few medical aid organizations already “on the ground,” as reporters and bureaucrats like to say, with a vast network of community health workers, trained volunteers, medical professionals, and supplies at the ready. Their response to the quake certainly saved thousands of lives. More to the point of Amy’s story, Partners in Health had and has the expertise to properly respond to a medical emergency in the poorest country in the Western Hemisphere. To omit any mention of their work, their expertise, and their ongoing mission is striking, to say the least. Amy focused on some naive but well-meaning Americans who were horrified by what they found in Haiti, dismayed at the lack of supplies and equipment, and unprepared to perform procedures that were appropriate to the circumstances of their patients’ lives. She asks an important question – how can we do better next time? – but, by keeping her focus on those who were unprepared and who made mistakes, she missed an opportunity to discover and communicate to her listeners what went right in the disaster response. Beyond their immediate response to the crisis – opening clinics in four of the camps for persons displaced by the quake, and providing vital support to the decimated Ministry of Health – Parters in Health doubled down on their community health work in response to the earthquake. Thanks to the incredible work of the volunteers and supporters of Zanmi Lasante (Kreyol for “Parterns in Health”), the 320-bed Mirebalais National Teaching Hospital is nearly completed, and scheduled to open next year. Partners in Health is working in Haiti, and in many other places, not just to “dispense aid,” but to partner with people and communities to help develop true public health infrastructure and skills. I would encourage Amy and “The World” to do a follow-up report on Partners in Health, to provide some balance, and to show that not all the well-meaning volunteers were poorly trained and under-equipped. Steve, Thank you for taking the time to listen and to write. It’s clear you care deeply about these issues and are very well-informed about the work of PIH. One of the great challenges of reporting is deciding which voices to include in any given story. And inevitably, there will be listeners who are deeply engaged in the issues you cover, who will wish you had included additional voices and perspectives. There has been much media coverage of the “good” work volunteers and agencies are doing in Haiti. What I wanted to look at in particular are the challenges facing international emergency medicine, which are challenges that extend well beyond Haiti. To me, the challenges the sector faces are significant: a lack of regulation, which enables just about anyone to go to a crisis zone and start practicing medicine…even surgery. There’s the lack of leadership, namely an overseeing body to coordinate international medical responses. At a more micro-level there’s traditionally been a lack of coordination among medical providers working on the ground. There’s also a lack of recordkeeping by volunteers and medical providers during major catastrophes, which makes it difficult, if not impossible, to meaningfully assess the quality of care provided. (This also leaves patients in the lurch and at risk.) There have been calls for greater transparency among agencies involved in international medicine; a problem highlighted by scholars who’ve tried to get data from medical providers to no avail. And, above all, there is clearly a need for more training among well-intentioned medical volunteers. As I reported, the consequences of the above challenges have grave consequences for patients: In Haiti, there are questions as to whether amputations could’ve been avoided and whether more lives and limbs could’ve been saved had arriving surgeons simply known to bring anesthesia with them…or if they’d known about the risks for infection that interventions like fixators present. If volunteers had been better trained they may have been more thoughtful about the need to plan for follow-up care and would be more likely to arrive in a place like Haiti as part of a comprehensive medical team that is equipped to respond more effectively to the myriad issues faced by patients. I’m sorry that you felt my story portrayed all volunteers as poorly trained and under equipped. In fact, the majority of voices in my piece were fully trained and fully equipped doctors! They were able to demonstrate and articulate how much you need to know and consider before volunteering in a crisis zone. The objective of Tiny Spark is to not only highlight shortcomings and the unintended consequences of “doing good”. It is vital that my stories are ultimately constructive. That’s why in this story, I addressed ways that those involved with international emergency medicine can move forward more effectively – by getting training — and to urge those involved at the highest levels in this field to figure out how to better coordinate and regulate this huge and growing sector. Many leaders in this field have expressed a desire for some kind of registration process and ultimately, an accreditation process for volunteers. Again, I do appreciate your taking the time to write, for highlighting the work of PIH, and for remaining engaged in the complicated struggle of bringing appropriate medical care to those in crisis. ← SoundCloud vs Public Radio – Where’s Tomorrow’s Audience?